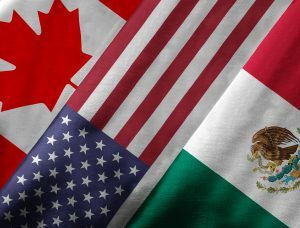 The US and Mexico last week bilaterally agreed the basis of a renegotiated North American Free Trade Agreement (Nafta), putting pressure on the third Nafta member, Canada, to follow suit. Talks between Washington and Ottawa failed to reach agreement by Friday’s US-imposed deadline, but will continue this week. Paul Maidment, director of analysis and managing editor of Oxford Analytica, a global advisory and analysis firm, answers nine critical questions about the process thus far, and what we can expect going forward. GTR: In the bilateral agreement with the US, what has Mexico given up? Maidment: Mexico has conceded significant ground over the auto sector, notably over the rules of origin. The current Nafta agreement calls for vehicles to contain 62.5% North America-made content. While the US wanted to raise this to 85%, Mexico has agreed to 75%. Around 30% of cars exported by Mexico do not meet the new figure, but producers will have a transition period of up to five years to reach it. Vehicles that fail to reach the limit will still be exportable to the US, but subject to a 2.5% tariff. What will have a more significant impact on the Mexican auto industry is the new requirement that 40%-45% of automobiles be manufactured in countries where workers earn at least US$16 per hour – a stipulation that will only affect Mexican factories. The average hourly wage in Mexico’s auto industry is estimated to be US$7-US$8 (compared with US$29 in the US). The extent to which that requirement will affect Mexican producers has yet to become apparent, but it is likely to hinder the manufacturing of auto parts. Another important concession by Mexico – and one that is particularly likely to frustrate Canadian negotiators – was the cancellation of Nafta’s independent dispute resolution mechanism. Trade disputes between member countries are now to be resolved in US courts. This will be a huge sticking point for Canada, and may force Ottawa into an unwanted choice between making diary concessions and saving the dispute resolution mechanism. Mexico also failed to get the increase in Nafta visas for Mexican nationals it sought. GTR: What has the US conceded? Maidment: Washington rowed back from its initial demand for a ‘sunset clause’ that would see the agreement expire automatically after five years unless all parties confirmed its continuation. Both Mexico and Canada oppose such a provision due to the uncertainty it would create among investors. Instead, the accord will be valid for 16 years, with reviews taking place every six years from 2024. US negotiators also dropped their demand that Mexico could only export specific agricultural products at certain times of the year. Agrarian trade will remain free of any tariffs or subsidies. US aims to curtail exports of textiles were conceded, but in the pharmaceuticals sector, 10-year patent protections were introduced for drug manufacturers. The absence of them from the original Nafta agreement was a particular pain point for US pharmaceutical companies, and now likely to become one, not so much for Mexico, but for Canadian pharma. GTR: What are Mexico’s priorities in the final renegotiation of Nafta? Maidment: First, to protect Nafta in the face of President Donald Trump’s belligerent rhetoric by ensuring new arrangements that would provide certainty, and to end the threat that Trump might either impose stiff tariffs on Mexican exports (notably automobiles and agricultural products) or withdraw the US from Nafta by executive order. Second, to have the renegotiation – with or without Canada – concluded before the president-elect Andres Manuel Lopez Obrador (AMLO) takes office on December 1. GTR: What are the advantages for AMLO if Nafta is renegotiated before he takes office? Maidment: The proposed six-year term agreed with Mexico dovetails with both the duration of the fixed one-term Mexican presidency and with what would be the end of a second Trump term. This will let AMLO simultaneously endorse the deal and distance himself from it. It would also take one highly contentious issue in US-Mexican relations off the table, and in that sense provide some economic certainty, if not necessarily stability, for Mexico. AMLO has made several early appointments to his team designed to demonstrate its economic competence to ease concerns about his populist left-wing economic policies more generally, which suggests he wants to send signals of economic stability to international investors. One such nomination was that of Jesus Seade, a respected economist and trade official, as his top Nafta negotiator and who participated in the latest negotiations. GTR: Who will ultimately decide if Nafta is revived or laid to rest? Maidment: Trump can end Nafta by pulling the US out by executive order, but he has to get the approval of the US congress for amendments to it. If ultimately there is a three-way accord on a reformed Nafta, rather than new bilateral deals, the legislatures of all three signatory countries would have to approve that. The US house of representatives, as a general matter, has to ratify all trade agreements that it has delegated the US president to negotiate. In this particular case, congress gave Trump the authority to pursue a renegotiated trade agreement with two other countries, not one. Legally, therefore, congress cannot at this point consider voting on a bilateral US-Mexico deal that excludes Canada. GTR: What is the risk of Trump pulling out of Nafta? Maidment: That would be the nuclear option, but the risk that Nafta collapses remains a severe risk. If Trump issued an executive order ending US participation, it would likely be challenged in the US courts, and damage to the economies of all three countries would probably be felt before legal cases were resolved. Mexico’s President Enrique Pena Nieto will hail the avoidance of such a scenario as a political victory, citing economic certainty as the primary justification for his government’s actions, which at least in some respects will look like a significant climbdown for Mexico. GTR: Where does Canada now stand? Maidment: The Trump administration’s tactic was to peel off Mexico with a separate agreement and then use that to press Canada to fall in line. Washington has much more economic leverage over Mexico City than it does over Ottawa. Friday’s deadline for Canada to join was self-imposed by the Trump administration. It was not met, but negotiations continue. Trump needs the deal settled quickly for domestic political reasons, notably the midterm US congressional elections in November, which will be a test of ‘Trumpism’, even though the president will not be on any ballot. Trump wants to be able to campaign for his fellow Republicans as having kept another of his pre-election promises. It should also be remembered that if the Democrats retake control of the house in the midterms, that could alter the political arithmetic in the US congress on Nafta. GTR: How much domestic US political support is there for Canada and Mexico’s positions? Maidment: The US-Canada trade relationship is stronger and more deeply intertwined with the overall US-Canada relationship than the US-Mexican one is. This is true not only at the federal level but also at the state, city and corporate levels in the US. It is thus one that has a lot more political protection from US legislators, governors and business groups than Mexico can rely on. Mexico’s position is further complicated by the immigration issue, which is at least as important for Trump’s political base if not more than ‘unfair trade’. GTR: Will a renegotiated Nafta cut the US trade deficit? Maidment: Not materially and not immediately, given the extended transition period for the auto sector changes. However, at this point, these renegotiations are about securing political wins for Trump ahead of the midterms. The post Nafta’s renegotiation in nine questions appeared first on Global Trade Review (GTR).